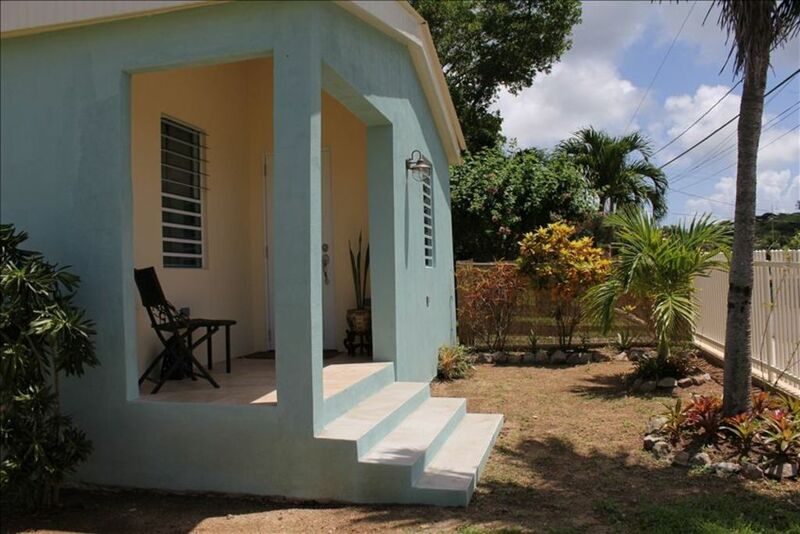 Coralina is the perfect casita for two people visiting the Caribbean. It is brand new and beautifully decorated with all the essentials that travelers need. Restaurants, shops and the Esperanza beach can be reached by walking 5 minutes. Coralina will charm you with its indoor and outdoor spaces. Every space has been used to it's maximum. Only quality furniture and materials have been used to decorate. Therefore, you are guaranteed attractive, comfortable accommodations. Coralina is cozy with its high ceilings, fully equipped kitchen, small breakfast table, sleeping area and beautiful bathroom. The cottage sleeping area has a back door exit to the outdoor shower. The outdoor shower was created for a private, natural return from your swims in the crystal clear waters of Vieques. Whether you shower inside or out, it will no doubt feel like vacation! Banana trees form part of the garden, as well as tropical palm trees. Also, the private gazebo will allow for outdoor leisure and meals. The front balcony is right at the entrance and provides a peek at the Caribbean ocean. Annette and Mireya are also the owners of Villa Coral Guesthouse in Vieques. Their five years of experience as innkeepers guarantee that Coralina has been well thought out with all the details you want in a rental. The location is ideal because Coralina is located on a high street in Esperanza, so you get a peek at the Caribbean Sea. In just 5 minutes walking, visitors can reach the main strip with restaurants, shops and the Esperanza Beach. At the same time, we are far enough away that the area is generally quiet at night. Several beaches are within walking distance from the casita. Esperanza beach is the closest, being a 5 minute walk. Sun Bay is a 20 minute walk. Vieques is an island without traffic lights or busy streets. The Esperanza town is quiet, yet the neighborhood is lively with horses strolling by, roosters and other furry neighbors. Perfect for enjoying Esperanza and the Biobay! Clean, easy, and bright, this adorable Casita has been a favorite of ours to return to year after year. Kitchen with eat-in dining table allows us to choose what meals to eat in and what meals to eat out. Bathroom has luxurious shower, bed is comfy and perfectly sized queen bed. The a/c unit makes sleeping on slightly too warm evenings just right, and overhead fans with lots of screened windows makes warm winter days dreamy and light-filled delight. We met with friends from the island on the outside covered gazebo, rinsed our sandy feet in the outdoor shower, and enjoyed the ocean views from the front porch. It's perfect. Our hosts, Mireya and Annette are always warm, friendly, and responsive when we needed something, and respectful and absent when we wanted our alone time together. This is a guest house, which means we take care of our own daily cleaning which we prefer, but we got fresh towels twice a week I think? And for a small extra fee, they were able to help us get our laundry done while we were there. Esperanza was amazing. We didn't know what to expect after Hurricane Maria caused so much damage, but it turned out that we had no trouble at all. Electricity on the island was fine, internet might have been actually better than before, and Verizon cell service spotty as ever, but suitable for texting at least. Almost all of the restaurants were open in town, and the biobay is the brightest I've ever seen it. We went out several nights during our stay, but couldn't the last bit due to full moon closure. If you've never been, put it on your bucket list and go! If you've been before, it's ok to go back. Things are on track there. Updated and very clean cottage! Loved staying here for our Vieques honeymoon. Perfect place for two. Loved the garden and outdoor shower (there is an indoor restroom/shower as well). Only thing that could improve the place are sharper knives. I cook a lot and the knives provided weren't cutting it (no pun intended)! Otherwise the place was more than perfect for our needs and the ladies running it were very nice. My husband and I stayed three nights, our only regret is that we didn't stay longer. The Co-owners were both very friendly and helpful. The casita is the embodiment of charming from the banana tree and hammock in the garden to the cozy bed. It was thoughtfully equipped with everything we needed to cook meals, relax, and lounge on the beach. We will most definitely stay again. We stayed in the "cottage" (villacoralguesthouse also rents rooms and an apartment), which is a little closer to the the Malecon (food, drinks, new friends), because we were staying a little longer (10 days) and wanted the more room and a kitchenette. We had to pay a little bit more but it was worth it. The place was clean and comfortable. We grilled chicken and pork chops on the outdoor gas-grill. There is a outdoor shower for cleaning up after the beach and place to store beach equipment provided (chairs, towels, & cooler). It is one block from Lydia's (small market) and the bakery (closed Sundays and Mondays). Night sky is nice too. We stayed in the "cottage" (villacoralguesthouse also have rooms and an apartment for rent), which is a little closer to the the Malecon (food, drinks, new friends), because we were staying a little longer (10 days) and wanted the more room and a kitchenette. We had to pay a little bit more but it was worth it. The place was clean and comfortable. We grilled chicken and pork chops on the outdoor gas-grill. There is a outdoor shower for cleaning up after the beach and for storing beach equipment provided (chairs, towels, cooler, and noodle). It is one block from Lydia's (small market) and the bakery (closed Sundays and Mondays). Night sky is nice too. 10 min. walk to restaurants & beach.